The Amerimax Craftsman Portrait Series is the company's mid range vinyl window that uses the SuperSpacer system, has triple weatherstripping and uses a double strength glass. Similarly to the Amerimax Masters Grande window, the Craftsman uses even sightlines and pretty similar energy efficiency numbers. The Amerimax Craftsman Portrait ordered in a number of different styles and configurations. The window comes standard with a fusion welded sash and frame, beveled exterior frame, dedicated pocket sill, slim line extrusion, brass roller system (slider), contoured pull rail, metal reinforcement meeting rail and dual action cam locks. I like the Amerimax Craftsman Portrait window. Assuming solid installation and a fair price point, I think consumers are getting a well made vinyl window that won't break the bank and will provide nice long term value. Consumers can expect Craftsman Portrait window prices to run $35 to $45 per square foot for the window itself. Comparable windows include the Milgard Tuscany window prices and Okna 400 windows cost. The Amerimax Craftsman Portrait gets pretty comparable numbers to the Master's Grande. The single hung with the Ameriglass E2 glass package delivers a DP40, U-value of .29, SGHC of .27, VT of .50. Very solid numbers for an "mid level" window. The Amerimax Craftsman Portrait single hung with the upgraded Ameriglass AG3 Neat glass package delivers a DP35, U-value of .28, SGHC of .22, VT of .51. 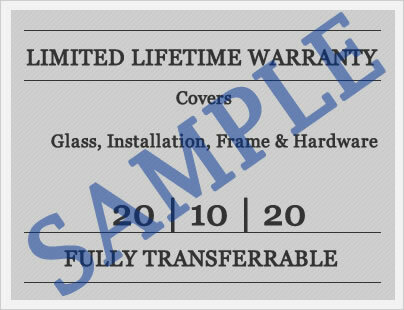 Amerimax offers a limited lifetime warranty on their Craftsman Portrait that includes a lifetime guarantee against material and manufacturing defects on the frame and sash, as well as all moving parts such as hardware. Insulating glass is warranted for life not to "fail." The warranty is transferrable one time and the company must be notified in writing of the change with in 45 days and there is a $75 charge for the transfer. As with all vinyl window warranties, there are a number of terms, exclusions and limitations that consumers need to be aware of so please read the warranty in its entirety before buying. Have a review on the Amerimax Craftsman Portrait window to share? Let us know your thoughts on the price, value, strengths and weaknesses of this window and the company itself. do you have Amerimax Craftsman Portrait questions? Questions on replacement window in general? Ask us your questions and get the answers you need from our panel of industry pros. Amerimax Craftsman or Millard Tuscany replacements? Same installation with new outside moldings etc. Tuscany runs about 1k less for all 7 windows I want replacing, but stuck with do I save a few bucks and have less of a window or is Tuscany just as good? David, my own personal opinion is that the Amerimax Craftsman Portrait and Milgard Tuscany are equal in quality, construction, and performance. Assuming you like the way the Tuscany looks compared with the Craftsman Portrait, I say save yourself the $1K. In terms of the windows, you are not sacrificing anything. Obviously, the installation company is something to consider as well.